The GE Venue 40 is a high-performance, tablet-sized ultrasound provides simple, yet sophisticated technology for high-resolution image quality and an intuitive interface. As a point-of-care ultrasound with three always-connected probes, physicians and users can easily bring this ultrasound to the patient for quick, detailed imaging. Physicians can also perform a variety of exams with pre-configured settings, including anesthesia, musculoskeletal, interventional, emergency, and critical care. The image quality of this portable ultrasound comes from CrossXBeam and Speckle Reduction Imaging (SRI) technologies. PW and Color Doppler are optional as well. 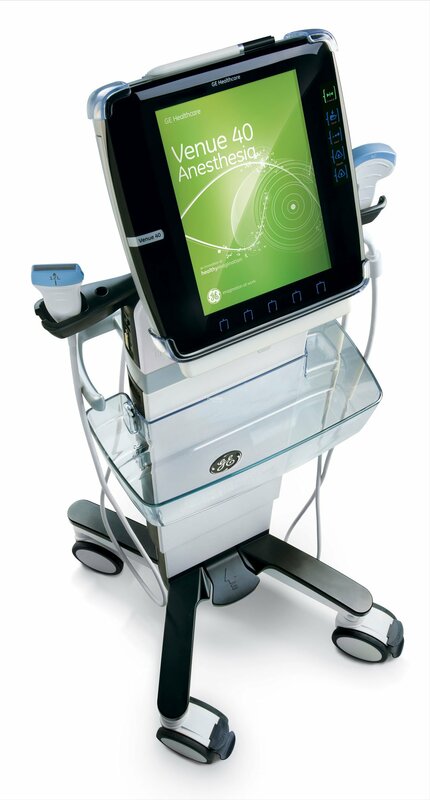 The Venue 40 ultrasound has no buttons or knobs and operates just like a normal tablet. Users can pinch, swipe, and touch to store, transfer, and analyze images. The touchscreen interface is durable and reliable, and it’s also quite easy to clean, ideal for sterile environments. Simply put, this thing is cool and it actually works. It’s not a Franken-Ultrasound like many manufacturers look to create today. It is designed for a specific market and doesn’t try to be everything-to-everyone. GE did a nice job creating this one. Aside from the great image quality, there are some other great features about the Venue 40. You can connect it directly to a computer or save images on an SD or USB flash drive.